We had looked around at different cots and cotbeds and were very unhappy with the quality. Most were quite flimsy and very expensive, I mean some were £400+ and still didn't look that well made. So we decided to go for the budget option but to buy one with good reviews. 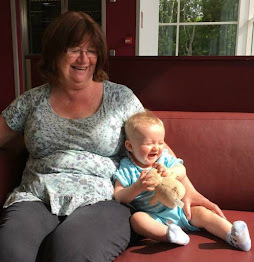 We decided on the East Coast Angelina cot bed and the pure white was on special offer from Tesco direct so we bought it and a mattress (Babymore Deluxe Sprung Cot Bed Mattress 140x70, see my review) using clubcard vouchers and cash. 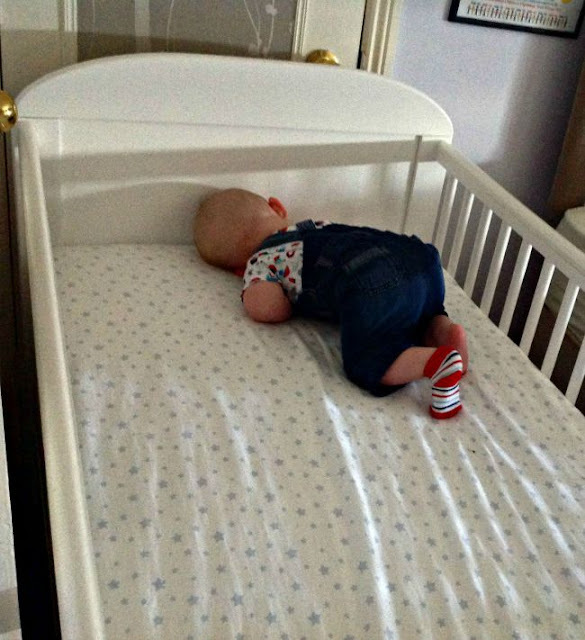 The cot bed cost £96, before any discount, which I think was a bargain as similar ones were very, very expensive. We had free delivery, always a bonus, and it did arrive quickly and just as described. It comes flat packed, doesn't everything now? It takes 2 people to assemble, its quite heavy and getting the bolts in to fix the base can be a bit of a nightmare. Otherwise it's straightforward enough and when assembled is very strong. It looks nice too. The base can be set at 3 heights and although its tricky getting the bolts to line up with the holes it's only something that has to be done infrequently. The sides do not go down, they are fixed into position. This can be quite tricky if you are lowering a sleeping baby into it as Bear nearly always wakes before he gets to the mattress, usually he just turns over and goes back to sleep. We've been using it since January and at first it was rarely used but since we have had Bear for 3 days a week it get lots of use for his naps. He didn't like it at first, maybe too big? He sleeps in a cot at home all snug at one end and he does look lost in this but he has slowly become used to it and takes most of his naps in it. Since this photo was taken the cot has been moved to another room and the base moved to the lowest position. It will adapt from a baby to toddler and up to 36 kilograms which is approx 11 years old. It is very big, measure your space first. I would definitely recommend this and would buy it again. Which? has a handy guide on the features and choosing a cot bed here. This is my personal opinion only. I have no connection to whoever makes or sells this item. I bought it with my own hard earned money. I am not an expert in childcare or child equipment. I take no responsibility if you purchase this and you do not like it, your child refuses to get into it or sleep in it, it doesn't fit in your room or any other reason whatsoever. Bear likes it and so do I.